Between the 2000 and 2004 elections the Hispanic population grew by 5.7 million persons accounting for half of the increase in the U.S. population of 11.5 million. However, nearly two-thirds (63%) of the people added to the Latino population were not eligible to vote in 2004 either because they were too young or because they were not U.S. citizens. In addition, Latino eligible voters registered and voted at lower rates than either whites or blacks. In the end Latinos accounted for only 10 percent of the increase in voters between the past two elections. In contrast, whites accounted for 29 percent of the population growth but produced 74 percent of the increase in votes cast because the demographic factors shaping the white population are different and because whites participated in the 2004 election at high rates. Consider also that in November 2004 the Hispanic population outnumbered the black population by nearly five million persons. Yet, the number of blacks eligible to vote was 7.3 million greater than the number of Hispanics. For Hispanics, a population of 41.3 million produced 16 million eligible voters. For blacks, a population of 36.4 million produced 23.4 million eligible voters. For decades now, population growth has translated into political power at a much lower rate for Latinos than for the other major ethnic and racial groups. As a result, voters are a much smaller share of the population for Hispanics than for the other groups, and the gap in the size of the Hispanic electorate relative to the Hispanic population will continue widening if current conditions persist. Between 2000 and 2004, the number of Latino voters jumped by 1.4 million or 23 percent, twice the growth rate of whites. Hispanics are indeed a fast growing population and a fast growing political presence at a time when other major segments of the rest of the U.S. population are growing slowly, if at all. However, in this case growth rates alone do not tell the whole story. When the baseline is low, relatively small numerical increases can produce big growth rates. And, when it comes to counting people in almost any category, Hispanics break their own records everyday. Growth, particularly in political arenas, has to be measured in context. So, what did adding 1.4 million voters do for Hispanic political clout? It boosted the Latino share of the total U.S. vote by a mere one half of one percent from 5.5 percent of the votes cast in the 2000 election to six percent last year, according to the CPS. And, what did it take to achieve that increase of one half of one percent? A total of four people had to be added to the Hispanic population to generate each one of those additional votes. The Hispanic population is more and more visible across the country, and its growth is increasingly controversial in some places. But, its political presence is far smaller by comparison. In assessing how growth in voting strength relates to overall population growth for Latinos and other groups, this report examines four population categories that represent different levels of political potential. The largest is the total population which includes all people of all ages and citizenship status. The electorate is made up of eligible voters, i.e., individuals who are both at least 18 years old and U.S. citizens. Registered voters are people who are eligible and who signed up to vote. Voters are the eligible who registered and then actually went to the polls. Among Hispanics these segments differ in size and characteristics more so than for any of the other major racial and ethnic groups. The Hispanic population is growing quickly by way of immigration flows, most of it unauthorized, and high birth rates. These demographic factors shape the relationship between the size of the total population and the size of the electorate. For Latinos, population growth yields increases in the number of eligible voters at a slower and potentially diminished rate compared to other groups. Fundamentally different demographic dynamics are at work in the nation’s major racial and ethnic groups. The white population, for example, is aging and growing slowly. Its voting-eligible population is being fed by a stock of native-born U.S. citizens turning 18 and by immigrants who gain citizenship through naturalization. Among whites, the non-eligible population actually shrank between the two elections with decreases in both the number of whites under the age of 18 (minus 670,000) and the number of adults who are not citizens (minus 24,000). As a result, the growth in the number of white eligible voters (4 million) was actually larger than the overall increase in the total white population (3.4 million). Of the 5.7 million Hispanics added to the U.S. population between the last two presidential elections, 1.7 million persons, or 30 percent, were less than 18 years old. Most are native-born U.S. citizens and hence will eventually become eligible voters. And, when they do, they will join the electorate at a rapid rate. The Latino under-18 population grew by 14 percent between the two elections. But, this is a fairly recent phenomenon. It is still literally a baby boom, and in political terms it will be a long time before these Latinos make their presence felt. About 80 percent of them still will be too young to vote in the next presidential election. The faster growth of the native-born youth population for Hispanics compared to whites is explained by two factors: The birth rate for Hispanic women is higher than it is for whites—82.0 vs. 56.5 live births per 1,000 females ages 15 to 44 (Downs, 2003). And, because this is the prime age group for immigration, women in those child-bearing years are a greater share of the Hispanic female population than among white females— 48% vs. 39% (U.S. Census Bureau, 2005b). The increase in the number of people under 18 only explains part of the reason that growth in the Hispanic electorate is so much smaller than growth in the Hispanic population. The other is immigration. A third of the increase (1.9 million) in the Hispanic population between the two elections was due to growth in the number of foreign-born non-citizens above the age of 18. According to estimates developed by the Pew Hispanic Center, two-thirds of all foreign-born Hispanics arriving in recent years have entered the country without authorization. Under current law some of those unauthorized migrants may eventually find a route to legal immigrant status and eventual citizenship, for example, by marrying a U.S. citizen, but the great majority will not. Even legislative proposals that would grant legal status to the unauthorized population envision a process that extends for several years at least. In November 2004, 11.0 million of the 15.1 million foreign-born adults in the total Hispanic population reported that they were not U.S. citizens. The Pew Hispanic Center estimates that 6 to 7 million of them are unauthorized migrants. That leaves about 4 million legal immigrants who could potentially become U.S. citizens at some point in the future if they decided to pursue naturalization and meet the requirements. But, the large proportion of undocumented migrants is not the only factor that produces a relatively low yield of eligible voters from the foreign-born Latino population; low rates of naturalization among Hispanic legal immigrants are an additional cause. With the exception of Cuban exiles, who constitute a special case, naturalization rates historically have been lower for immigrants who hail from countries geographically close to the United States. This includes Mexico and several other major sources of legal immigrants from Latin America as well as Canada. In addition, older, more affluent and better educated immigrants are more likely to naturalize than their younger, less well-off counterparts, and each of those factors further reduces the share of Latino immigrants gaining citizenship. (See Fix, Passel, and Sucher 2004 and Table B3 Appendix B.) As a result of all these factors only 27 percent of the adult Latino foreign-born population in 2004 had gained U.S. citizenship compared to 54 percent of the adult non-Latino foreign-born. Population increase through immigration yields a relatively small share of eligible voters and that yield has shrunk in recent years. The number of adult foreign-born Latinos who had become U.S. citizens through naturalization and were thus eligible to vote increased by 668,000 between the two elections. That means that one-quarter of the adult immigrants added to the Latino population were citizens. This proportion represents a drop in the share of eligible voters produced by the growth of the Latino foreign-born population compared to the period between the 1996 and 2000 elections when more than a third of the increase was added to the rolls of eligible voters, according to the CPS. This recent decrease reflects a drop in the number of all legal immigrants becoming citizens in recent years, Hispanic and non-Hispanic alike. Following the September 11 attacks, the processing time for naturalization applicants stretched out and the pace of naturalizations slowed as background checks became more extensive and personnel resources were diverted to other tasks. Data from the Department of Homeland Security shows that in the three years prior to the 2000 elections (FY 1998-2000) nearly 2.2 million immigrants of all national origins were granted citizenship compared to 1.6 million in the three years after the 2000 vote (FY2001-2003). The pace of naturalization for immigrants of Hispanic origins mirrored this trend. Both of the demographic factors analyzed above—the production of young people and immigration flows—have been in place long enough among Hispanics that the electorate is a much smaller share of the population than for the other major racial and ethnic groups. 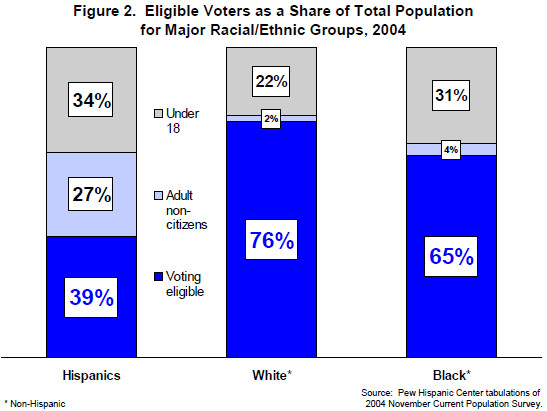 Demographic factors reduced the share of eligible voters produced by the Hispanic population compared to whites and blacks. Lower levels of political participation—the propensity of eligible voters to register and then cast ballots—further reduced the share of actual voters produced by the Hispanic electorate. Again, simple growth rates suggest a surging Hispanic political presence, but, as before, growth rates assessed in context show that the actual increase in voting power is below its potential. According to the CPS, 9.3 million Latinos were registered to vote and 7.6 million cast ballots in November 2004. Both measures marked increases in the number of Hispanics engaged in the political process compared to the 2000 election that were larger than for the other major ethnic and racial groups. (See Table B2, Appendix B.) For example, the number of registered Hispanics grew from one election to the next at more than twice the rate as among whites (18% vs. 8%) and so did the number of voters (23% vs. 11%). Despite these gains, however, Latinos’ ballot-box clout grew very little. They represented only 6 percent of all the votes cast in 2004 and that was just a half a percentage point more that the 5.5 percent of the total votes that Hispanics cast in 2000. What happened? Eligible Latinos registered to vote in 2004 at a significantly lower rate (58%) than either whites (75%) or blacks (69%). These differences do not reflect the effect of the 2004 campaign which produced widespread increases in political participation, but rather they date back at least to the previous presidential election. In 2000, 57 percent of Hispanic eligible voters had registered compared to 72 percent of whites. 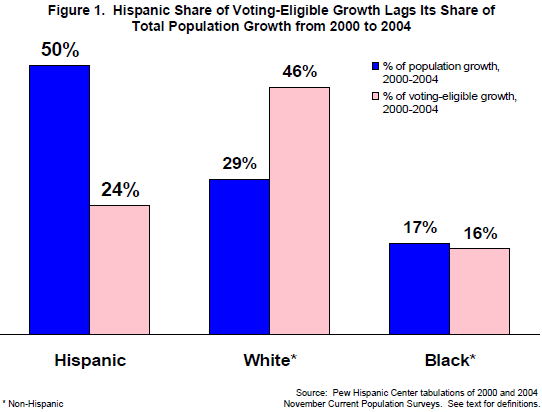 How significant are the gaps between Hispanics and whites in registration and voting? If Hispanics had registered and voted in 2004 at the same rates as whites in their age brackets, Hispanics would have cast an additional 2.7 million ballots. That would have represented 36 percent more Hispanic votes than the 7.6 million that emerges from the CPS. Both the registration and voting gaps matter in this calculation, but the registration difference is of greater import. Of the hypothetical 2.7 million additional Latino votes, 2 million would have come from the registration differences and 700,000 can be attributed to the gap in turnout among those registered. This substantial shortfall in Latino registration occurred despite several extensive efforts by non-partisan groups as well as political players to register Hispanic eligible voters ahead of the 2004 election. Another way of looking at the relative levels of political participation is to compare the number of people who actually voted to the number who were eligible to vote. In the Hispanic population 47 percent of the eligible voters went to the polls compared to 67 percent of whites and 60 percent of blacks. The 20 percentage point gap between Hispanics and whites in this measure can be explained by three factors. The Latino electorate is somewhat younger than the white electorate, and all young people have lower rates of registration and voting. The difference in the age profiles explains 3 percentage points of the gap. Differences in reported voting turnout by registered voters accounts for another 5 percentage points. But, again in this calculation, lower rates of registration by eligible voters is by far the largest factor and is responsible for 12 percentage points of the gap between Latinos and whites. Demonstrating the zeal of converts, Latino immigrants who become citizens report somewhat higher rates of political participation than the native born. In 2004, foreign-born Latino citizens were more likely to report registering to vote than U.S.-born Latino adults (60% vs. 57%). Similarly, foreign-born Hispanics who registered to vote were also more likely to report voting than their native-born counterparts (87% vs. 80%). Citizenship is a major barrier to political participation for foreign-born adult Latinos. But, once citizenship is attained, foreign-born status does not dampen political engagement. The demographic factors and political participation rates described above combine to create a situation in which the Hispanic population has considerably less representation at the ballot box than other major racial and ethnic groups. While 51 percent of all whites and 39 percent of all blacks voted in 2004, only 18 percent of the Hispanic population went to the polls in 2004. Put another way, in 2004, each white vote represented two white persons, whereas each Latino vote represented five Latinos. And, despite the very substantial growth of the Hispanic population since 2000, these disparities only grew wider. In 2000, Latino voters were 17 percent of the Hispanic population compared to 47 percent among whites and 36 percent among blacks. 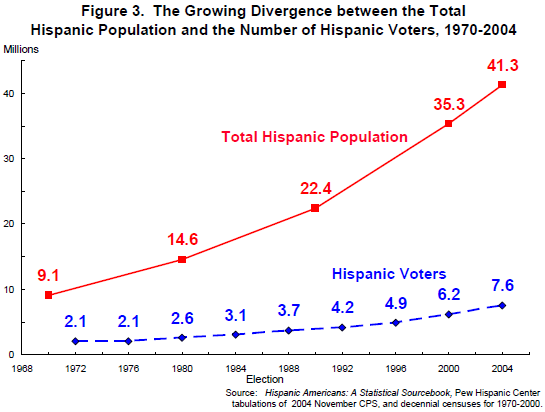 The gap in population and voting strength has been growing for more than 30 years as can be seen in Figure 3 below which offers a historical comparison of the number of Latino voters and the total Latino population. The difference between the vote and the population is now far larger than for either whites or blacks, and there is every indication that it will continue to grow as long as the demographic factors and the participation rates remain unchanged. The large number of Hispanic young people will eventually add to the Latino electorate as they reach voting age. But, if immigration flows continue adding to the number of Latino females of child bearing years, and Hispanic fertility rates and immigration flows persist at current levels, even larger numbers of youth will be added each year to the population not eligible to vote. And, if participation rates remain unchanged, the young people added to the electorate will register and vote at relatively low levels.